I love coffee. But sometimes I want a hot beverage and I don’t want caffeine, and I don’t want tea, and I don’t want decaf coffee, and I don’t want super sugary syrupy café hot chocolate, and I don’t want flavorless weak powder crap, or delux expensive hot cocoa mix… gee, I am hard to please. So I make my own. It’s super easy. Actually I’m enjoying some right now. Just after a snowy winter evening run, what could be better than a mug of hot chocolate and pajamas? I just dump all the ingredients into my Ninja blender. The bold items you shouldn’t skip or you’ll be sad. The other ones are totally optional. 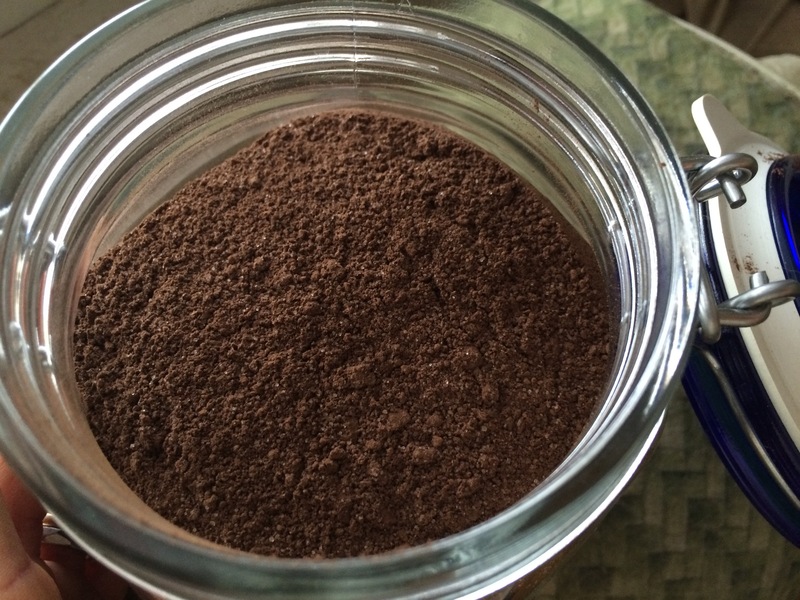 .6 oz (1/3c) instant coffee (I use the decaf Mount Hagen freeze dried stuff). .5 oz chicory (which I grind to a fine powder in my coffee grinder first). Cinnamon, chile and cayenne powder for a Mexican twist. I just keep blending away until it’s a nice powder. It makes about 3 cups of mix. To serve, Cooks Illustrated says to heat 1 cup milk in a sauce pan and when it starts to steam and bubble add 1/4 cup chocolate mix and whisk constantly until simmering. I just add boiling water to a generous scoop of the mix. Stir until dissolved. Then I add a little cold milk so I can drink it without scalding. Sometimes I bring the powder to work and don’t even bother with the milk. Less decadent, but it’s good enough for me. This entry was posted in Kym Cooked and tagged coffee, Cook's Illustrated, cooking, easy cooking, hot chocolate, winter. Bookmark the permalink. HMMM..Sounds good! My boys love hot chocolate so much! Thanks! My particular version isn’t very kid friendly (it’s not very sweet and I favor the more bitter flavors of dark chocolate and coffee). But the beauty of Cook’s Illustrated is that they explain why the base recipe works well so you can tinker with it without destroying it. I’d love to know a little more about yourself in your About page. Perhaps you can share who’s in your household (who are you cooking for?) and where in the world is your home? On the internet you never know where people are! Obviously where you are will change what is in season for you to be cooking with.